VATICAN CITY (CNS) — Families are weakened and destroyed by war, “the mother of all forms of poverty,” as well as by economies and policies that worship money and power, Pope Francis said. “It’s almost a miracle” that, even in poverty and crisis, the family can keep on going, safeguarding its bonds and staying intact, he said at his weekly general audience in St. Peter’s Square June 3. 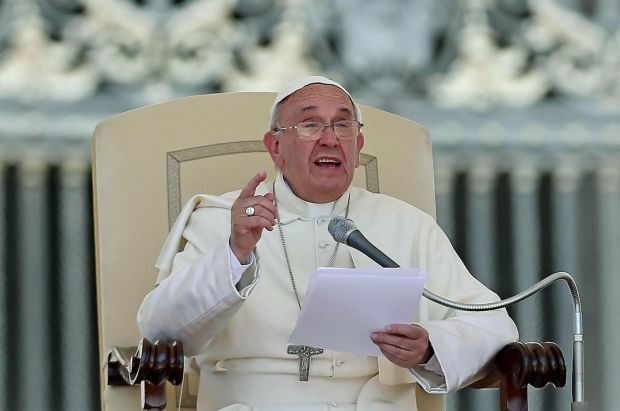 Continuing a series of talks about the family, the pope began a new chapter addressing the various social conditions and problems that put today’s families to the test. But despite such difficulties, there still are many poor families who are able to live “with dignity, seeking to live their daily life” and placing their trust in God, the pope said. The ability of some poor families to persevere, “however, must not justify our indifference, but, if anything, increase our shame that there is so much poverty,” he said. “What are we left with, in fact, if we give in to the extortion of Caesar and Mammon, of violence and money, and we also reject familial attachments?” he asked. “Today’s economy often specializes in the enjoyment of individual well-being, but widely practices the exploitation of family relationships. This is a serious contradiction,” he said, criticizing economic and political experts as being “stingy” in not recognizing or including the “enormous work of the family” in their analyses and balance sheets. “A new civil ethics will come about only when those responsible for public life reorganize social bonds starting with the fight against the perverse spiral” of poverty, he said. Fighting poverty is not just a matter of families getting “bread” on the table, the pope said; it is about having jobs, stable employment, education, health care, housing and transportation. The conditions found in poor neighborhoods and “the reduction of social services — health care and schooling — cause further difficulties” for families, he said. Spread by the mass media, “fake models” of the family based on “consumerism and the cult of appearance” also harm families, he said, and have a greater impact on poorer families and increase the breakdown of family ties. By becoming “poor” and practicing simplicity, the pope said, the church can break down “every wall of separation, especially from the poor” and become more effective in responding to poverty. The poor will be the first to judge those who ignore their cries, he said, followed by God’s judgment and curse “if we don’t do these things” commanded in the Gospel.